The HyperTransport® Consortium is an internationally recognized standards body focused on producing open-standard protocols that enable computing-system designers to improve overall performance. Samtec is a contributing member of the Consortium. HT's highly efficient protocol makes it the ideal choice as a chip-to-chip, board-to-board and chassis-to-chassis high-performance interconnect, which is successfully deployed in the widest range of consumer, commercial and mission-critical applications, including gaming systems, embedded designs, networking equipment, personal computers, workstations, servers, and supercomputers. 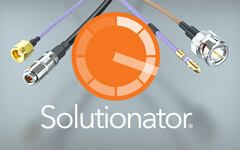 The HT3 Node Cable and Connector meets the consortium's need for a next-generation high-speed high-density I/O system optimized for the demanding environment within equipment racks. Primarily, the design allows for the tightest side-to-side and over-under stacking, yielding the highest possible density in a box, and in a rack. 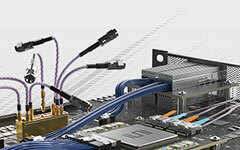 The HT3 Node system interconnect, HDR-149112-XXXX, is the flagship of Samtec's HDLSP cable family. Using legacy PCIE Card slots is another strategy for employing HyperTransport®. If needed, Samtec can also provide these familiar connectors. HyperTransport® is a registered trademark of the HyperTransport® Consortium.